My beautiful GSD Tia - she never fails to bring a smile to my face!!! I got Tia when she was 8 months old from a family who couldn't look after her properly. She is now just over 12 months old. I jumped at the chance to own one of these stunning dogs. I was told she was weary of males as she grew up in a female household but within the first week she had grown in trust and since then we have been unseperable. We have had our troubles with her though with separation anxiety but i seem to have got through that phase too after lots of hard work. Now instead of an overly anxious dog i come home to find her sat atop of my dining table with puppy dog eyes, ears flopping about as though trying to say "about time your back, where have you been without me." We spend long daily walks and play time at home. After having border collies previously Tia a gsd was a different challenge completley but i think we got it made. She is a great companion and would recommend a gsd to anybody with the time to train and give them the lifestyle a large breed dog needs. She never fails to make me smile, even when i have had a bad day just one look into them eyes make your cares go away. Hello to you, Kevin. 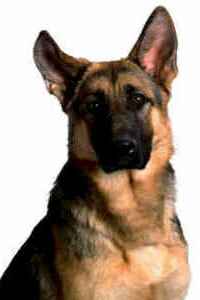 We are so glad you decided to come and share your GSD story with us. Thanks to you for taking the time to come by here and sharing your story of rescuing Tia with us right now. I wish more people would do this - there would be so many less dogs ending up in shelters and even worse. Tia will prove to be a great companion for you all - I have no doubt about that. And by providing her with a good home I’m sure she’ll repay the favor over and over throughout her life. Good luck!